Nightshift is a collection of 20 short stories ranging from the bizarre and the thought provoking, to the down right macabre. Featuring such classics as Children of the Corn and Salem's Lot, these stories have been not only read, but turn into movies, earning their place as a staple in horror classics for decades, and it's easy to see why. It's no doubt that King is a skilled writer, and I've devoured dozens of his books. 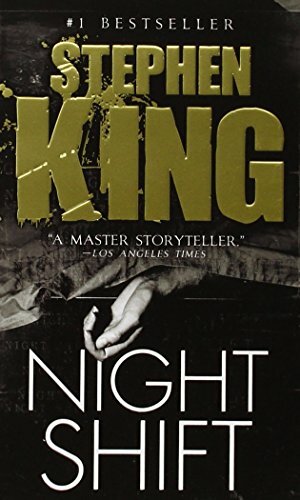 I'm not sure why I always shy away from short stories when choosing my next read, but coming across a gem like Nightshift, reminds me all over again why I need to give them a chance. Quick glimpses into horror and dystopia, Kings stories keep my synapses firing long after I finish. I was quickly enraptured, "just one more story", until I found myself curled up under the blanket in an attempt not to wake my husband as I read feverishly into the night. Then subsequently scared to stop reading for fear of every creak of the house settling, or groan of wind at the window. If you are in the mood for spine tingling horror and creepy crawlies, this is definitely your next read. Just make sure to read it with the light on.... and don't go accidentally summoning any demons.